Straw is the stems of cereal crops, left over after grains such as rice, wheat, barley and oats have been harvested. When packed and tied into tightly compressed bales, this material turns into excellent building blocks, fire-resistant and highly insulating. Straw bale construction takes two main forms: “load-bearing,” in which the bale walls support the weight of the roof, and “infill,” in which a post-and-beam framework does most of the structural work. Bale buildings first appeared in the Great Plains over 100 years ago, and have been rapidly gaining popularity since the late 1980’s. 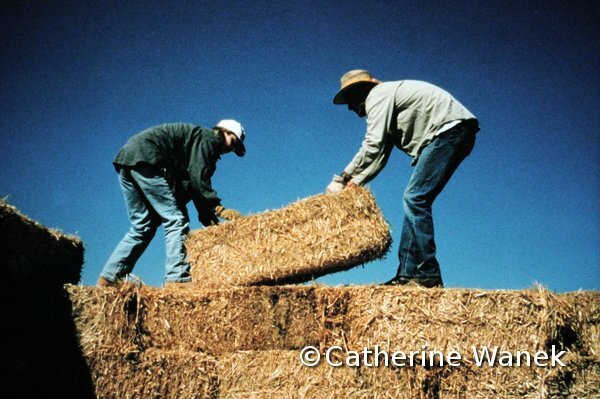 Many states and jurisdictions (including California) have adopted straw bale building codes, making this technique relatively easy to permit and finance.